Preheat oven to 375°F. Mix the pork, egg, shallot, fish sauce, chopped cilantro, pepper, and a few pinches of the sugar until well combined. With a 1/4 cup ice cream scoop, evenly divide the meat into meatballs and arrange on a rimmed baking sheet, allowing 1 inch space between each meatball. Roast meatballs in oven until browned; approximately 15-20 minutes. To make do chua (daikon and carrot pickle), heat the vinegar and water in a small saucepan with the sugar and salt until completely dissolved. Pour over the carrots and daikon in a shallow, airtight container (or in quart mason jars) and store in the fridge. This can be done in advance (the flavor will be better if you do it the day before). To make the sriracha mayonnaise, combine the mayo with the hot sauce. Assemble the sandwiches by spreading mayo on the bread and then layering on the do chua, sprigs of cilantro and jalapeño (if using). Nestle four or so meatballs into each sandwich. Additional optional banh mi fillings: pate, ham loaf, headcheese, shredded chicken, etc. Banh Mi (or bánh mì) are popping up everywhere these days, it seems, and no wonder: cheap, fast and filling has always been a winning combination. A Vietnamese baguette, when done correctly, is ethereal and light with a delicate crust. 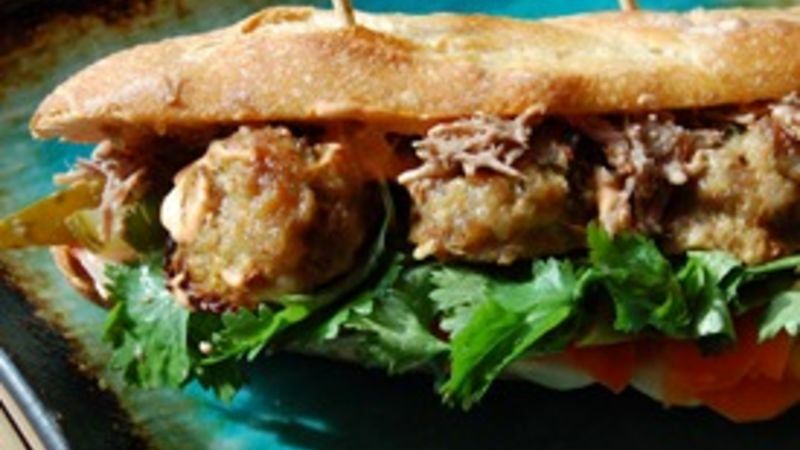 It is the perfect vessel for a sandwich, and the banh mi — a type of sandwich usually made with grilled meat (pork or chicken are most common), cilantro and pickled carrots and daikon (called do chua) — is a perfect marriage of Vietnamese and French culinary traditions. I’ve had banh mi many ways: BBQ chicken; “the works” with thinly sliced ham roll, grilled pork and pâté; and shredded pork skin with tripe. I've made them a few times myself, too, because A) they're really easy and B) I really couldn't stand the shredded pork skin and tripe version (which I received by mistake). I'm still a little terrified that the person taking my order will misunderstand me and that I'll end up getting it by accident again. Oh, most important, C) I'm a bit of a control freak, so making my own lets me know exactly which meat I'm using. It's hard to find free-range, local, organic meat in a $4 sandwich. If you don't want to fuss with meatballs, you can use store-bought rotisserie chicken dressed up with 1/4 cup of hoisin sauce mixed with a teaspoon of fish sauce, a teaspoon of sugar, one minced garlic clove, a tablespoon of finely chopped lemongrass and some black pepper. You can also grill thinly sliced pork with this sauce. If you're a vegetarian, you can make a version with an omelet, seitan (mock duck), tempeh or tofu; use the same sauce, but with soy sauce instead of fish sauce. If you like weird stuff like head cheese (like I do, the good German girl that I am), this is a great place to use it. Layer on your do chua and a handful of cilantro. Add some thinly sliced jalapeño if you like your food to hurt a little. Enjoy with a beer and chips. Make a picnic of these, and you will rule!